Pedro Domingos likes big ideas. He sets out to describe to us how computers can write their own programs. For example, there is the well-established case of handwriting recognition. This is a form of machine learning in which the computer is provided with sufficient examples (and a training set) to enable the machine to learn to do something. If you show the machine the number “9” written enough ways, the machine eventually becomes as good or even better than a human at recognising a handwritten “9”. Unfortunately, he alternates between very sensible and clear description like this, and sweeping optimistic generalisations. Mr Domingos is in no doubt who the new masters of the world are going to be. In his potted description of commerce, he describes the how “the progression from computers to the Internet to machine learning was inevitable … once the inevitable happens and learning algorithms become the middlemen, power becomes concentrated in them.” In fact, there is no future for any company without using machine learning: “a company without machine learning can’t keep up with one that uses it … businesses embrace it because they have no choice.” That’s a very stern conclusion! Without waiting to catch breath, the author continues with ever more upbeat conclusions. He reveals himself in the process to have a very naive view of many subjects outside of machine learning. For example, in politics, he claims that Obama won his first presidential election because of machine learning. That may be so, but the author then continues to describe how a perfect political system might work: “In the future, provided voter models are accurate, elected officials will be able to ask voters what they want a thousand times a day and act accordingly – without having to pester the actual flesh-and-blood citizens.” If any politician was such a slave to voter wishes, the country would be in chaos. Asking what consumers want to buy a thousand times a day may be feasible; to run a country in the same way would be disastrous. But there is still more: the whole of evolution can be reduced to machine learning: “evolution is an algorithm”. In warfare, we don’t have to worry, because “in the army of the future, learners [machine learning devices] will greatly outnumber soldiers, saving countless lives.” So that’s all right, then! Fortunately, after this frantic introduction, Mr Domingos gets down to his area of professional expertise, and describes actual methodologies. These are more mundane, are the subject of disagreement between their various champions, and haven’t yet revealed the secrets of the universe. In fact, we might not be so excited about machine learning if we used some of the alternative names given to it – including pattern recognition, statistical models. That doesn’t sound like true intelligence at all! Nonetheless, this is the world of machine learning. 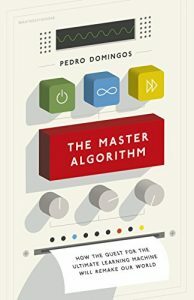 To listen to Pedro Domingo “machine learning experts are an elite priesthood even among computer scientists. Many computer scientists … don’t understand machine learning as well as they’d like to. This is because computer science has traditionally been about thinking deterministically, but machine learning requires thinking statistically. If a rule for, say, labelling emails as spam is 99 per cent accurate, that doesn’t mean it’s buggy; it may be the best you can do and good enough to be useful.” We can understand the nature of machine-language reasoning without having to agree that machine-learning experts are the new priesthood. Except that we don’t know what that algorithm is. Much of the book can be dismissed as idle speculation about what form this algorithm might take. But it is revealing that there can be few authors so confident that this algorithm will ultimately be found, and it will be a good thing. Much more useful is the description of the five main schools of thought for machine learning, Symbolists, using logic, connectionists, trying to reverse engineer the brain, evolutionaries, trying to simulate evolution on the computer, Bayesians, using statistics and probabilistic inference, and finally analogizers – inferring similarities to predict results. In addition, there are fascinating comparisons between machine learning and the way the humans learn, both in childhood and as adults. Unfortunately, the breathless style doesn’t always pause long enough to define the many terms used clearly and intelligibly. I ended up having to revert to other sources, such as Wikipedia, to compare definitions of terms. So, what can be retrieved in this book amid all the optimistic speculation? I emerged from the book a believer in machine learning, without a doubt, but not quite in the glowing terms with which Pedro Domingos describes it. And if I wanted a calm assessment of the ethical implications of machine learning, this is not the book I would turn to.